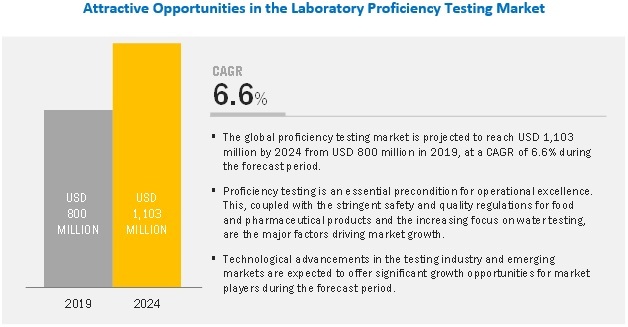 [310 Pages Report] The laboratory proficiency testing market is projected to reach USD 1,103 million by 2024 from USD 800 million in 2019, at a CAGR of 6.6% during the forecast period. PT forms an essential precondition for operational excellence and accreditation in several industries. This is one of the major factors driving the growth of the proficiency testing market, globally. Also, the stringent safety and quality regulations for food and pharmaceutical products and the increasing focus on water testing are the other major factors supporting market growth. However, the requirement of high capital investments for accurate and sensitive testing is expected to restrain the growth of this market during the forecast period. 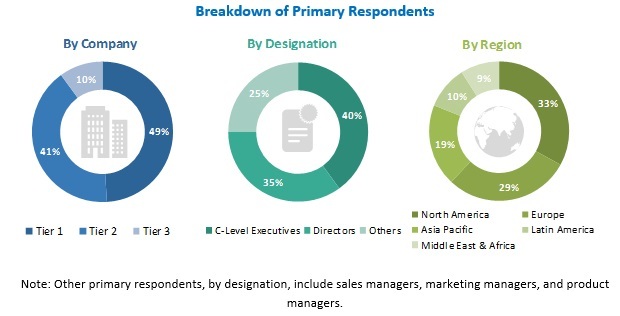 In the pharmaceutical proficiency testing market, by type, the branded drugs segment is expected to grow at the highest CAGR during the forecast period. The stringent regulatory policies regarding the safety and efficacy of drugs, time-consuming clinical trial processes, and longer drug development processes for novel prescription medications are some of the major factors that have increased the focus on proficiency tests for branded drugs. In the cannabis/opioids proficiency testing market, by type, the residual solvents segment is expected to witness the highest growth during the forecast period. The harmful nature of chemical residual solvents that are often not eliminated during the extraction of cannabinoids and terpenes from cannabis plants is one of the major factors driving the need of cannabis/opioids proficiency testing for residual solvents. The laboratory proficiency testing market has been segmented into five major regions, namely, North America, Europe, the Asia Pacific, Latin America, and the Middle East & Africa. North America is expected to dominate the laboratory proficiency testing market during the forecast period. This can be attributed to the mandatory adoption of proficiency testing to demonstrate operational excellence, increasing regulatory stringency regarding laboratory operations, and the presence of a large number of global proficiency testing providers in North America. Also, North America is a major hub for industries such as pharmaceuticals, food, water & environment, commercial beverages, cosmetics, and cannabis testing. A large number of laboratories in this region undertake the testing of products across these industries. With PT becoming a prerequisite for ensuring laboratory QC, various laboratories across industries are undertaking these programs and thus aiding market growth. The prominent players operating in this market are LGC Limited (UK), Bio-Rad Laboratories (US), Randox Laboratories (UK), Merck (Germany), College of American Pathologists (US), American Proficiency Institute (US), Waters Corporation (US), QACS (Greece), FAPAS (UK), AOAC (US), Phenova Inc. (US), Weqas (Cardiff), Advanced Analytical Solutions, LLC (UK), Bipea (France), Absolute Standards Inc. (US), and NSI Lab Solutions (US). In March 2018, Fera Science launched the world’s most thorough wine proficiency testing scheme in partnership with Isvea srl (Italy) and Fera’s agent in Italy—StarEcotronics. In February 2018, Randox and Qnostics entered into a strategic partnership under which Randox will have access to the Qnostics molecular range of products for sales and distribution, while Qnostics will have access to Randox’s commercial capabilities to increase the market penetration of molecular quality controls and custom services. In January 2018, LGC expanded its immunosuppressant certified reference materials portfolio with the launch of Human blood - sirolimus (ERM-DA111a). In January 2018, LGC upgraded its VALIDATE THY linearity and calibration verification kit by adding Free Triiodothyronine (FT3) as a component of Total Triiodothyronine (TT3). The kit evaluates Cortisol (CORT), Free Thyroxine (FT4), Free Triiodothyronine (FT3), Thyroid Stimulating Hormone (TSH), Total Thyroxine (TT4), and Total Triiodothyronine (TT3). In February 2017, LGC acquired API Food Quality, Inc. (US), along with the associated trade and assets, to create a new North American hub for its global proficiency testing operations. This acquisition enhanced LGC’s market-leading portfolio of proficiency testing schemes for the food industry. In January 2017, Merck acquired BioControl Systems Inc. (US), a global leader in food safety testing. The acquisition opened growth opportunities for Merck in the food and beverage space, particularly in the US. In August 2016, Merck launched two new products supporting the identification of the industry-standard alcohol biomarker with high sensitivity, and seven new products ensuring accurate identification of omega-3 and omega-6 fatty acids for diagnostic testing. Who are the top 10 players operating in the laboratory proficiency testing market? What are the driving factors, restraints, opportunities, and challenges in the laboratory proficiency testing market? What are the industry trends and the current scenario in the laboratory proficiency testing market? What are the growth trends in the laboratory proficiency testing market at the segmental and overall market levels? Which industry and technology can be a potential revenue pocket for market players in the next five years? Who are the visionary leaders, dynamic differentiators, innovators, and emerging players, and what are the key strategies adopted by them to strengthen their positions? *Business Overview, Products Offered, Test Programs, Recent Developments, SWOT Analysis, MnM View Might Not Be Captured in Case of Unlisted Companies. This study involved four major activities in estimating the current size of the laboratory proficiency testing market. Exhaustive secondary research was carried out to collect information on the market, its peer markets, and the parent market. The next step was to validate these findings, assumptions, and sizing with industry experts across the value chain through primary research. Both top-down and bottom-up approaches were employed to estimate the complete market size. Thereafter, market breakdown and data triangulation were used to estimate the sizes of segments and subsegments. The laboratory proficiency testing market comprises several stakeholders such as healthcare analytical testing service providers, proficiency testing service providers, contract research organizations (CROs), food & feed testing service providers, and water and environment testing companies. Primary sources from the supply side, including CEOs, vice presidents, marketing and sales directors, business development managers, and innovation directors of proficiency testing companies, have participated in this study. Demand-side primary sources include industry experts such as directors, VPs, managers, department heads, and laboratory technicians of testing service providers. The industry’s supply chain and market size, in terms of value, have been determined through primary and secondary research. After arriving at the overall market size—using market size estimation processes as explained above—the market was split into several segments and subsegments. In order to complete the overall market engineering process and arrive at the exact statistics of each market segment and subsegment, the data triangulation and market breakdown procedures were employed, wherever applicable. The data was triangulated by studying various factors and trends from both the demand and supply sides. Further breakdown of the Latin American proficiency testing market into Brazil, Mexico, and others.